China has announced plans for a "new leap forward" after the first meeting in four years of the Communist Party's Central Committee. The blueprint unveiled by the committee shows Peking's determination to spread the words of leader Mao Zedong and purge all those "who have followed the path of capitalism". According to news broadcast on Radio Peking, the committee wholeheartedly endorsed Chairman Mao's purge and "rectification" programme described as the "great proletarian cultural revolution". The radio report said the committee had strongly reaffirmed the nation's "hard line" at home and abroad. It also called on people for renewed efforts to fulfil economic goals. Chairman Mao attempted to stimulate agricultural and industrial production during the first Great Leap Forward in 1958. By reorganising small collectives into great communes he hoped to release workers for industry with the aim of driving up steel production. But the plan backfired - grain output declined leading to the country's biggest famine while industry began producing masses of unwanted, shoddy goods. Today's report from the Central Committee confirms that conditions now exist for a "new leap forward" - four good successive harvests, progress in nuclear technology and the "invigorating revolutionary atmosphere" prevailing in the country". According to Chinese News Agency reports, Chairman Mao received a tumultuous reception three days ago when he visited supporters in Peking and called on them to carry the great proletarian cultural revolution through to the end. Editorials in the People's Daily and Red Flag newspapers subsequently called on the nation's revolutionary masses to expose the "bourgeois rightists" who were marching "on the capitalist road". The recent dismissal of Pen Cheng, the Mayor of Peking, who ranked sixth in the party's Politburo, can now been seen as a warning to leaders of equally high rank, such as, Premier Chou En-lai, who has been associated in the past with more moderate policies. The Central Party says anti-socialist right-wingers should receive "severe punishment" - but they should also be given a chance to repent and begin a new life. It suggests any errant party leaders should overcome their fear of becoming the objects of struggle by engaging in sincere self-criticism. Thirty-five million copies of "The Selected Works of Mao Zedong" are to be printed within the next 18 months so his thoughts can be relayed to the masses said to be eagerly waiting to study and apply Mao's work. Write your account of the events. The Cultural Revolution heralded a dramatic purge of Mao's rivals. He mobilised the Red Guards, bands of radical students who were ordered to destroy the four "olds" in the country, customs, habits, culture and thinking. 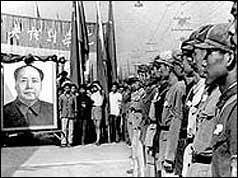 Colleges were shut so they could concentrate on revolution but the Red Guards began to terrorise almost anyone who stood for authority, attacking teachers and even parents, many of whom were tortured or beaten to death. Altogether around three million people were denounced and tens of thousands died in prison. At the same time Mao removed many of his opponents from within the party and retook absolute control of the party hierarchy. The revolution ended officially only with Mao's death in 1976.